Beautiful room, great service, excellent location. Hazelton is the best. You can't find better location than this in downtown Toronto. Quite, close to shopping, museums, good restaurants, transportation, easy to reach interesting neighborhoods and entertainment. Close to Royal Ontario Museum, Gardiner Museum, Bata Shoe Museum & chi chi Yorkville shopping area. 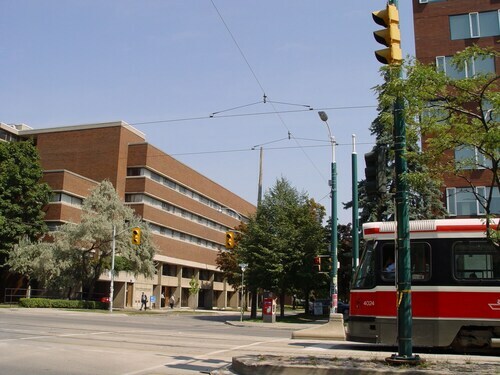 Beyond the building, the hotel is situated in a wonderful part of the city: you are within a short walk of many fine restaurants, the Royal Ontario Museum, the grounds of the University of Toronto, and so on. I love shopping in Yorkville and going to the Royal Ontario Museum so the Plaza is perfect for us! Royal Ontario Museum is located in a vibrant area of University District known for its array of dining options and popular theater scene. The neighborhood is home to 702 hotels and other accommodations, so you can find something that works for your stay. InterContinental Toronto Yorkville: With a stay at this 4-star hotel, guests can enjoy access to a restaurant and an indoor pool, along with WiFi. It's a favorite with Expedia travelers for its bar and clean, comfortable rooms. Avalon Suites Yorkville: This 4-star condo features free WiFi, a 24-hour fitness center, and a café. Our customers like its helpful staff and proximity to shopping. After you've visited Royal Ontario Museum, you can discover the sights within just a few miles of the area. Casa Loma, Hockey Hall of Fame, and Art Gallery of Ontario feature captivating exhibits. Explore notable local landmarks like Nathan Phillips Square, Harbourfront Centre, and The Distillery Historic District. You can check out the local talent at Ed Mirvish Theatre, Elgin and Winter Garden Theatres, and TIFF Bell Lightbox. University of Toronto - St. George Campus and Yonge-Dundas Square are some sights worth a visit in the area. You might also stop by Ryerson University, located 1 mi (1.7 km) from Royal Ontario Museum, or Toronto Eaton Centre which is 1.1 mi (1.8 km) away. With so many ways to get around, seeing the area around Royal Ontario Museum is a breeze. Nearby metro stations include Osgoode Station, St Patrick Station, and St Andrew Station. To see more of the surrounding area, hop aboard a train at Toronto Union Station or Toronto Exhibition Station. Flights from Calgary Intl. to Barcelona Intl. Flights from Pearson Intl. to Alfonso Bonilla Aragon Intl. Flights from Pearson Intl. to Raja Sansi Intl. Flights from Calgary Intl. to Fort Lauderdale Hollywood Intl. Flights from Pearson Intl. to Abbotsford Intl.